During the summer we go swimming at least once a week . . . and then on the weekends, for most holidays and randomly just to survive the 100+ degree heat. At almost 14 months, Weston is absolutely ready to get in the water, but definitely in need of swim diapers. With the other two boys, I used disposable diapers, but we didn’t swim but a handful of times while they were both in diapers. So I’ve found myself contemplating adding in the expense of swim diapers to our budget and I just don’t want to have to scrape together another $10 – $12 every time we run out. 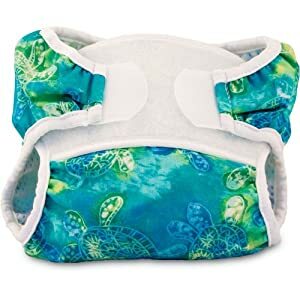 My solution was to purchase a reusable swim diaper that he should be able to use the entire summer and, depending on his growth pattern, into next summer. It only cost me $12.75 and shipping was FREE with a purchase of $25. I should more than make my money back by not having to buy multiple packages of disposable swim diapers.